AP Chief Minister Chandrababu Babu Naidu and some leaders who lack knowledge of either history or geography, claim that Bhadrachalam is an Integral part of Andhra Pradesh, though it is otherwise. 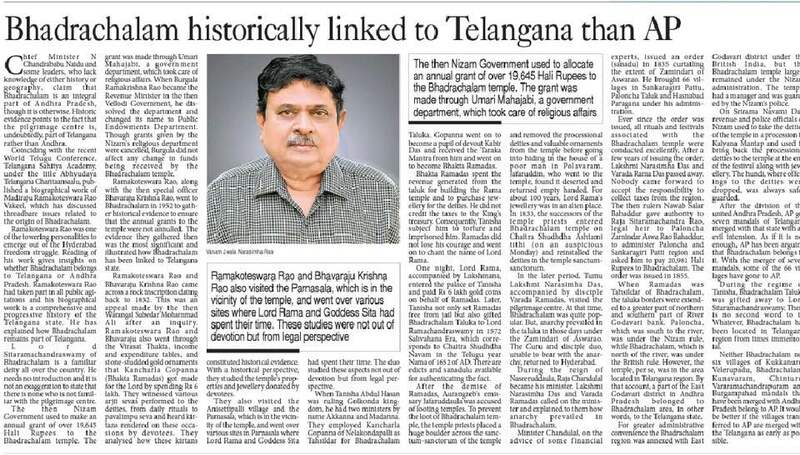 Historic evidence points to the fact that the pilgrimage centre is undoubtedly, part of Telangana rather than Andhra. Coinciding with the recent world Telugu conference, Telangana Sahitya Academy, under the title Abhudaya Telangana Charitaansaalu, published a biographical work of Madiraju Ramakoteswara Rao vakeel, which has discussed threadbare issues related to the origin of Bhadrachalam. Ramakoteswara Rao was one of the towering personalities to emerge out of the Hyderabad freedom struggle. Reading of his work gives insights on whether Bhadrachalam belongs to Telangana or Andhra Pradesh. Ramakoteswara Rao had taken part in all public agitations and his biographical work is a comprehensive and progressive history of the Telangana state. He has explained how Bhadrachalam remains part of Telangana. Lord Sitaramachandraswamy of Bhadrachalam is a familiar deity all over the country. He needs no introduction and it is not an exaggeration to state that there is none who is not familiar with the pilgrimage centre. The then Nizam Government used to make an annual grant of over 19,645 Hali Rupees to the Bhadrachalam temple. The grant was made through Umart Mahajabi, a government department, which took care of religious affairs. When Burgula Ramakrishna Rao became the Revenue Minister in the then Vellodi Government, he dissolved the department and changed its name to Public Endowments Department. Though grants given by the Nizam’s religious department were cancelled, Burgula did not affect any change for the Bhadrachalam temple. Ramakoteswara Rao along with the then special officer Bhava Raju Krishna Rao, went to Bhadrachalam in 1952 to gather historical evidence to ensure that the annual grants to the temple were not annulled. The evidence they gathered then was the most significant and illustrated how Bhadrachalam has been linked to Telangana region. Ramakoteswara Rao and Bhava Raju Krishna Rao came across a rock inscription dating back to 1832. This was an appeal made by the then Warangal Subedar Mohammad Ali after an inquiry. Ramakoteswara Rao and Bhava Raju also went through the virasat takhta, income and expenditure tables, and stone-studded gold ornaments that Kancharla Gopanna (Bhakta Ramadasu) got made for the lord by spending Rs 6 lakh. They witnessed various Arjit Seva performed to the deities, from daily rituals to Pavalimpu Seva and heard kirtans rendered on these occasions by devotees. They analysed how these kirtans constituted historical evidence. With a historical perspective, they studied the temple’s properties and jewellery donated by devotees. They also visited the Anisettipalli village and the Parnasala, which is in the vicinity of the temple, and went over various sites in parnasala where Lord Rama and goddess Sita had spent their time. The duo studied these aspects not out of mere devotion but from legal perspective. When Tanisha Abul Hasan was ruling Golkonda kingdom, he had two ministers by name Akkanna and Madanna. They employed Kancharla Gopanna of Nela Kondapalli as Tahsildar for Bhadrachalam Taluka. Gopanna went on to become a pupil of devout Kabir Das and received the Taraka Mantra from him and went on to become Bhakta Ramadasu. Bhakta Ramadasu spent the revenue generated from the taluk for building the Rama temple and to purchase jewellery for the deities. He did not credit the taxes to the king’s treasury. Consequently, Tanisha subjected him to torture and imprisoned him. Ramadasu did not lose his courage and went on to chant the name of lord Rama. One-night lord Rama accompanied by Lakshmana, entered the palace of Tanisha and paid Rs 6 lakh gold coins on behalf of Ramadasu. Later, Tanisha not only set Ramadasu free from jail but also gifted Bhadrachalam taluka to lord Ramchandra Swamy in 1572 Salivahana Era, which corresponds to Chaitra Sudha Navami in the Telegu year Nama of 1652 AD. There are edicts and sanadulu available for authenticating the fact. After the demise of Ramadasu, Aurangzeb’s emissary Jafarudddaula was accused of looting temples. To prevent the loot of Bhadrachalam temple, the temple priests placed a huge boulder across the sanctum-sanctorum of the temple and removed the processional deities and valuable ornaments from the temple before going into hiding in the house of a poor man in Polavaram. Jafaruddin who went to the temple, found it deserted and returned empty handed. For about 100 years lord Rama’s jewellery was in an alien place. In 1833, the successors of the temple priests entered Bhadrachalam temple on Chaitra Sudha Ashtami Tithi and reinstalled the deities in the temple sanctum sanctorum. In the later period, Tumu Lakshmi Narasimha Das, accompanied by disciple Varada Ramadasu, visited the pilgrimage centre. At that time, Bhadrachalam was quite popular. But anarchy prevailed in the taluka in those days under the zamindari of Aswarao. On the request of the Guru and disciple duo and on experts advise the then Minister Chandulal issued an order (Sanad) in 1835 curtailing the extent of zamindari of Aswarao. He brought 66 villages in Sankaragiri Patti, Paloncha taluk and Husnabad pargana under his administration. Ever since the order was issued all rituals and festivals associated with the Bhadrachalam temple were conducted excellently. After a few years of issuing the order, Lakshmi Narasimha Das and Varada Ramadasu passed away. Nobody came forward to accept the responsibility to collect taxes from the region. The then rulers Nawab Salar Bahaddur gave authority to Raja Seetaramachandra Rao legal heir to Paloncha Zamindar Aswarao Bahaddur to administer Paloncha and Sankaragiri Patti region and asked him to pay 20,981 Hali Rupees to Bhadrachalam. The order was issued in 1855. When Ramadasu was tahsildar of Bhadrachalam the taluka border was extended to a greater part of northern and southern part of River Godavari bank. Paloncha, which was south to the river, was under the nizam rule, while Bhadrachalam, which is north of the river, was under the British rule. However, the temple per se, was in the area located in Telangana region. By that account a part of the East Godavari District in Andhra Pradesh belonged to Bhadrachalam area in other words to the Telangana state. For greater administrative convenience the Bhadrachalam region was annexed with east Godavari district under the British India for a while. But the Bhadrachalam temple largely remained under the Nizam administration. The temple had a manager and was guarded by the Nizam’s police. On Sriram Navami day revenue and police officials of Nizam used to take the deities of the temple in a procession to Kalyana Mandapam and used to bring back the processional deities to the temple at the end of the festival along with jewellery. The hundi where offering to the deities were dropped, was always safe guarded. After the division of the united Andhra Pradesh AP got seven Mandals of Telangana merged with that state with an evil intension. As it is not enough AP has been arguing that Bhadrachalam belongs to it with the merger of seven Mandals. Some of the 66 villages have gone to AP. During the regime of Tanisha Bhadrachalam taluka was gifted away to lord Sitaramachandraswamy. These is no second word to it whatever Bhadrachalam has been located in Telangana region from times immemorial. Neither Bhadrachalam nor six Mandals of Kukunoor, Velerupadu, Bhadrachalam Kunavaram, Chintur, Vara Ramachandrapuram and Burgumpad Mandals that have been merged with Andhra Pradesh belongs to AP. It would be better if the Mandals transferred to AP are merged with the Telangana as early as possible.